It’s always a red-letter day when Ford takes the cover off a new truck. Historically they like to do it in Texas where they know it will be fully appreciated, and this year was no exception. This is a heavy-duty truck that is breaking a lot of the rules. We probably won’t be driving it until the middle of 2016, but the performance features look to me like another winner in the making. Alas, there are not photos yet available showing the new truck in its sporting habitat or towing a boat, but you get the idea. It seems as though they believe there are more horses than boats in the state. Based on the success of their aluminum-bodied F-150, this new Super Duty will rely on the lighter-weight material to reduce body weight. 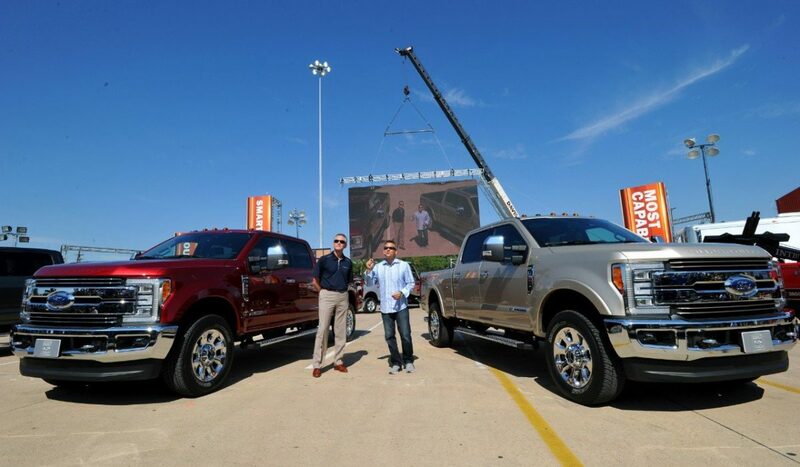 While the F-150 saves about 700 pounds, which gave a lift to tow capacity, most of the weight savings on the Super Duty is being reinvested into its performance features, so the added tow load will only be about 350 pounds. Still, they company has managed to share the bulk of the F-150’s cab with this new entry. There are a number of parts exclusive to the Super Duty. The bed is produced from high-strength military-grade aluminum allow, as are the other aluminum parts. The frame is also new. Made from 95% high strength steel and fully boxed, Ford says that this is the strongest Super Duty frame ever — 24 times greater in stiffness than its predecessor. It stands to reason then that everything else is supersized: axles are beefed up, as are the drivetrain, and brakes. While a tow hitch is now standard for Super Duty trucks, it will be a while before tow capacity numbers are released by Ford. The company is using superlatives when they say where it will fall against the competition. The market requires lots of choices for heavy-duty trucks and the 2017 Ford will be right up there with alternatives. There will be regular, SuperCab and SuperCrew layouts, a pair of drivetrains, two bed lengths plus chassis cab, and five trim levels including the King Ranch and Platinum editions. The are also a range of engines: the PowerStroke diesel 6.7L V8, a 6.8L gas-powered V8 (for chassis cabs only), and a 6.2L gas-powered V8. I expect that horsepower/torque numbers will be released closer to launch. Since these are heavy-duty trucks, we won’t receive official EPA mpg numbers, but will share our real-life experience when we drive. The 6.2L is mated to a new six-speed transmission, while there will also be some variation of the six-speed that is in use today. As with engine info, there is a lot that has not been released. 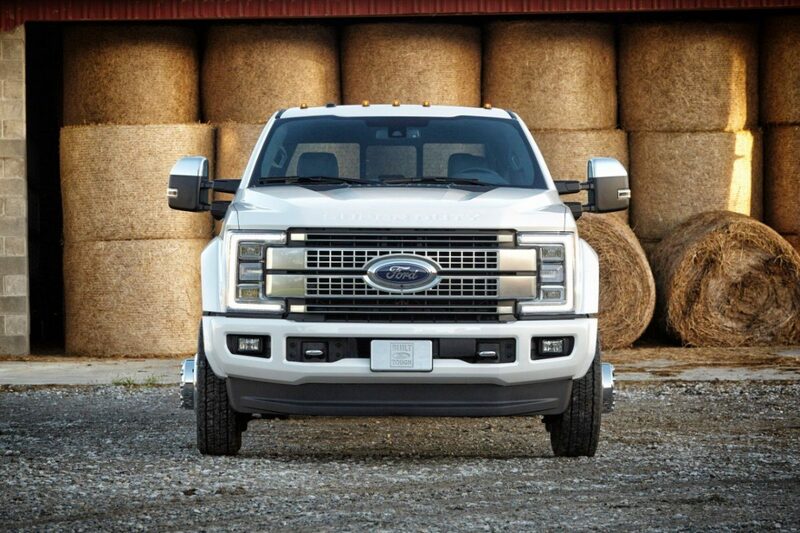 The exterior of the 2017 Super Duty is beefy and bold, and should continue to delight Ford fanatics and others. There is a generous quantity of new lighting, including LED bed lights. I suspect the newly designed lighting throughout will be fuel efficient, as well. Early in my career it was typical for manufacturers to spend as little as possible on truck interiors and comfort features. Not so today. The upcoming Super Duty is loaded with greatly expanded storage — possible since the design incorporating as much as 6′ of added cabin space. There is more storage, sensibly relocated switches and brake controller. There is, in fact, more of everything. Seats are super comfortable and are available with a massage feature. Just because…. Ford’s exclusive inflatable rear safety belts are an excellent safety feature for this kind of multi-function vehicle. 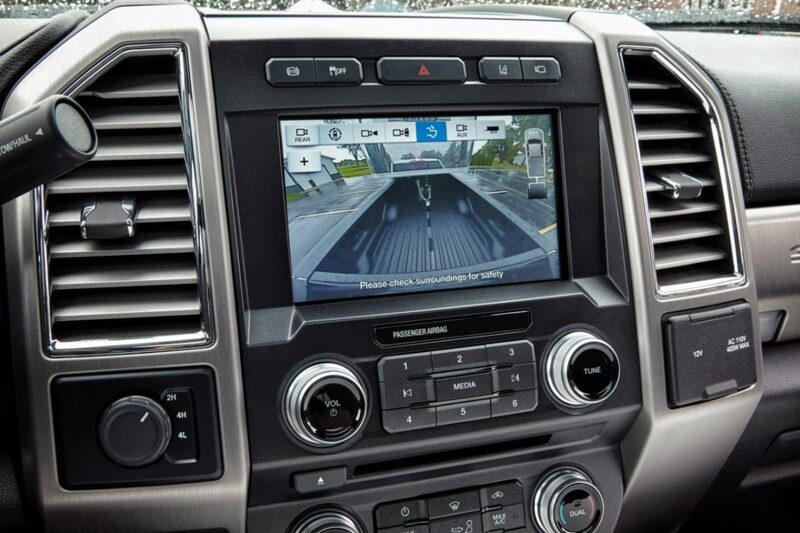 Ford has often been a leader in technology and safety features. 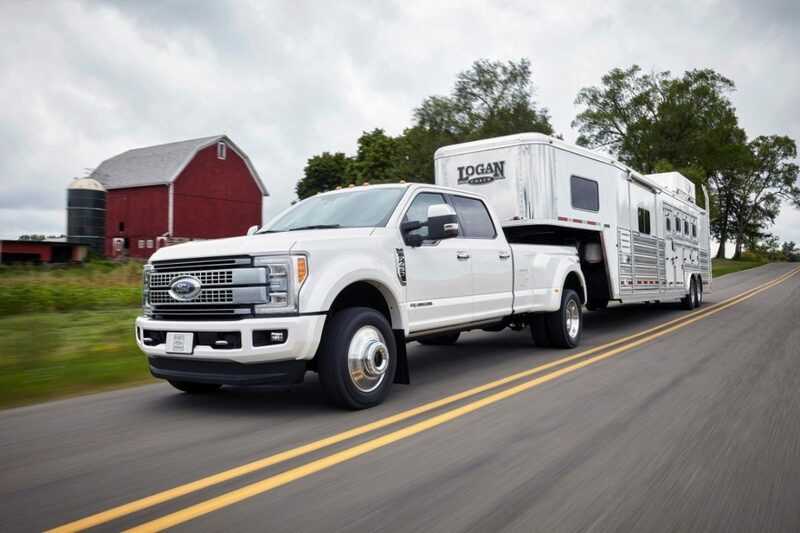 As a lover of the Raptor/F-150 front view camera, it’s nice to report that the new Super Duty has a 360-degree camera system, and a new over-bed camera is available to make it easier to hook or undo a 5th wheel or gooseneck. There is also an on-screen feature to advise if the trailer angle is wrong. There is also lane departure warning, adaptive cruise control,blind spot monitoring and other features that make trailer towing easier. This new Super Duty brings on many of the features that Ford has brought on incrementally, as well as making good use of the technology and materials expertise that has made the F-150 a hit.